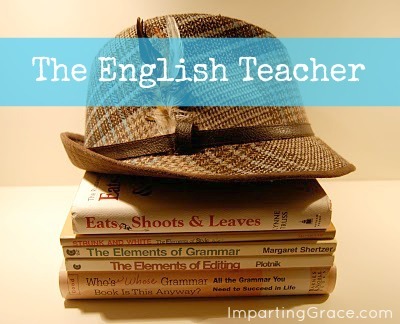 Imparting Grace: English teacher: Why does good grammar matter? Sometimes I get asked if good grammar is worth the trouble. "Why bother?" people ask me. That's a question worth considering. The truth is that most of us can make ourselves understood when we're speaking. Our grammar might be highly imperfect, but we make up for that with tone of voice, word emphasis, pauses, gestures, facial expressions, etc. Good grammar is not the point. Really. As much as I love to discuss English grammar--and I do!--I must remember that it's simply not the point. Good grammar is a means to an end, not the end in itself. So what IS the point? Communication. Language is a gift from God, given only to humans, for the purpose of communication. Have you ever thought about that? All kinds of creatures communicate with one another in various ways, but humans alone have been given the gift of language. It's a special gift, a tremendously valuable gift. It's valuable because it serves the purpose of communication. Human beings can communicate with one another in vast and powerful ways. Not all communication involves language, to be sure, but a great deal of it does. In years past, most communication occurred via the spoken word. But we citizens of the age of the internet communicate mostly via the written word. Every day we have opportunities to communicate with others. Every day we have chances to make ourselves understood. Every day we can blow those chances if we don't use our language well. Use of the wrong word or lack of proper punctuation isn't really a big deal in and of itself. But if your readers can't understand what you're trying say? That IS a big deal. Taking the time to use language correctly is, at its heart, a sign of respect for your readers. If you make a mistake, don't fret about it--just correct it and be glad you had the chance to make the correction. Perfection isn't the goal. Communication is the goal. In short, the question is "Does good grammar really matter?" My answer: It matters if you have something to say. If you have a word of cheer or hope or light, your use of grammar matters. Because the world needs to understand your message. A word fitly spoken is like apples of gold in settings of silver (Proverbs 25:11). I am a bit of a grammar nerd, and when I see obvious mistakes while reading it drives me crazy! I hate when I publish a blog post and then later realize I had a big mistake glaring in my post! Ugh...then I wonder how many people saw it before I corrected it:) I love the verse that you referenced! I've said it before: I do not have perfect grammar and I don't remember all the rules. Sometimes on my blog I purposely type the way I speak, knowing that technically it's incorrect (kinda, starting a sentence with "but", etc). But (ha, ha!) I believe I have what I call an innate sense of grammar; actually it comes partly from being a voracious reader since age 5. All that being said, it bugs me when I see glaring grammatical mistakes, particularly in printed or professional works. It's not professional, and it makes me question that entity's ability to do something well and pay attention to details. So I agree that communication is important, and one of the things bad grammar can communicate is ineptitude! Such a good word, Richella! I was just thinking about this today. Sometimes I get so caught up in the minutia of correct or incorrect grammar, but you're right...it's about communication and not just correct grammar. I guess that's why I'm such a grammar nerd. I want to clearly communicate with others. That was well communicated. :) I know I have a hard time with English. My brain works way ahead of my hands. It is hard for me to communicate my thoughts sometimes. I am not a writer, which makes blogging a little difficult for me. I like pictures:) I 'm your newest follower; I hope you will visit me too. I have to ditto Holly! Even though my degree is in English, my focus was on literature. I know I mess up here and there, but I know little slip ups aren't going to make or break me. BUT...if my blog was filled with mistakes and errors, I think I'd lose readers after awhile. It grates on a reader's sensibilities to have to try and make sense of what someone is writing. Did you hear that they've added ♥ (yes the heart symbol) and things like LOL and OMG to the Oxford English Dictionary? I think the internet is taking over reality.